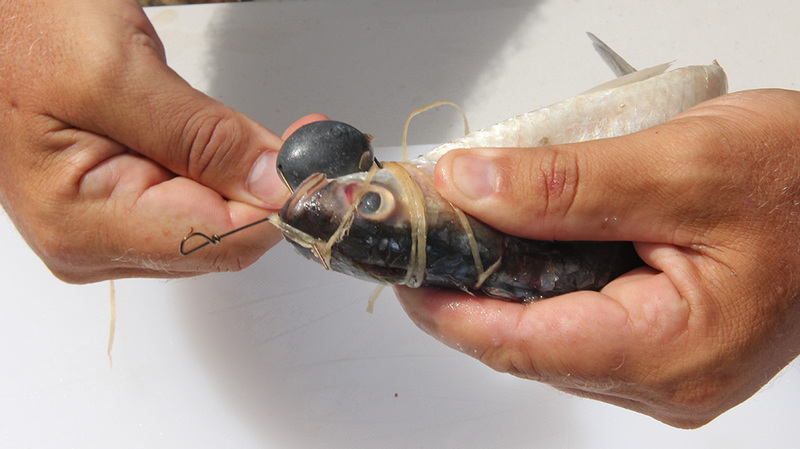 A fresh mullet makes an irresistible addition to your offshore dredge teaser. 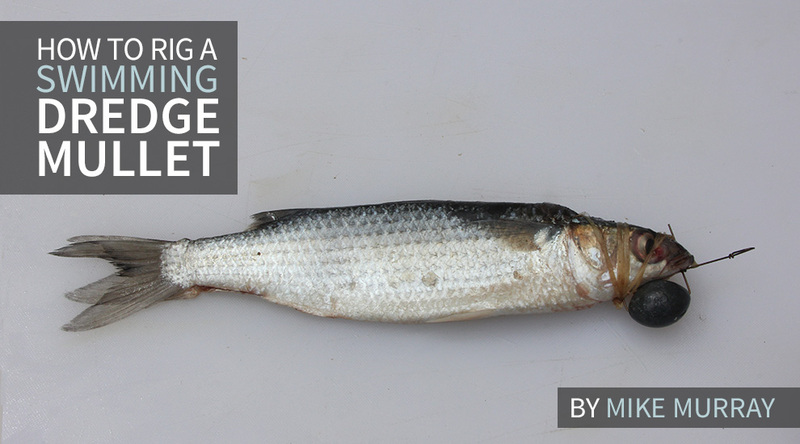 Learn how to use a pin rig and chin weight to easily rig mullet for your dredge. 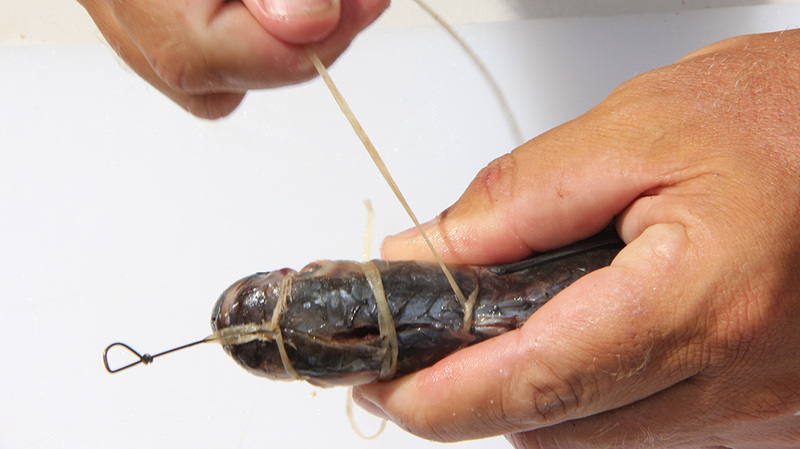 These baits are guaranteed to draw big pelagics into your spread. 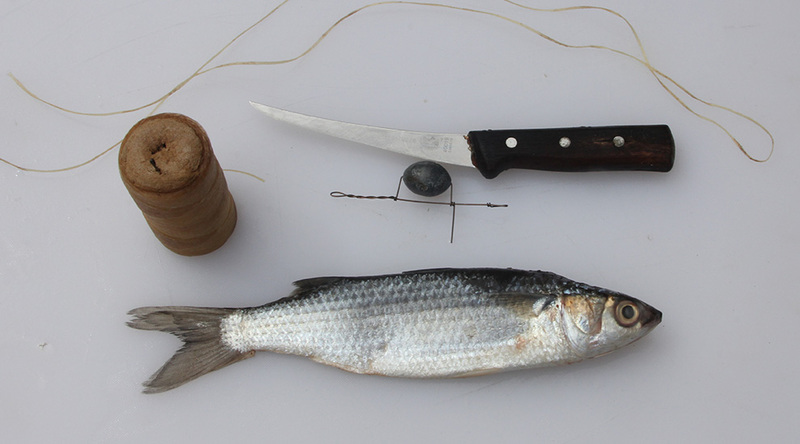 Materials: A fresh deboned and wedged mullet, 3-ounce egg sinker on a pin rig and 3 to 4 feet of heavy waxed rigging floss. The mullet should be wedged and deboned for proper swimming action. 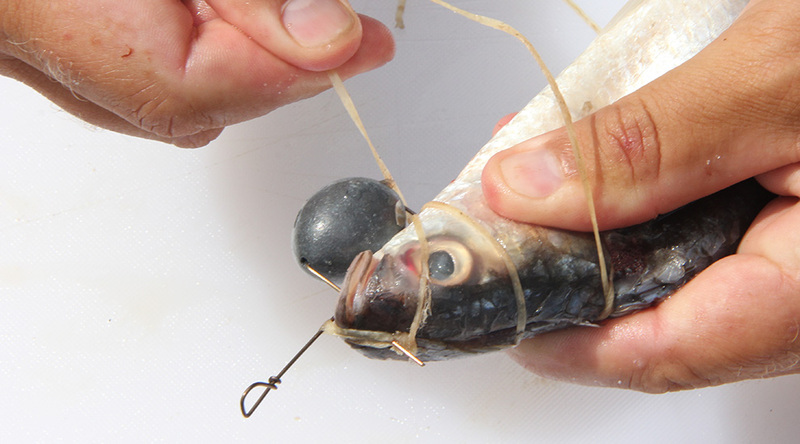 Wedging the top of the head will reduce the bait's profile in the water, helping it to swim straighter. 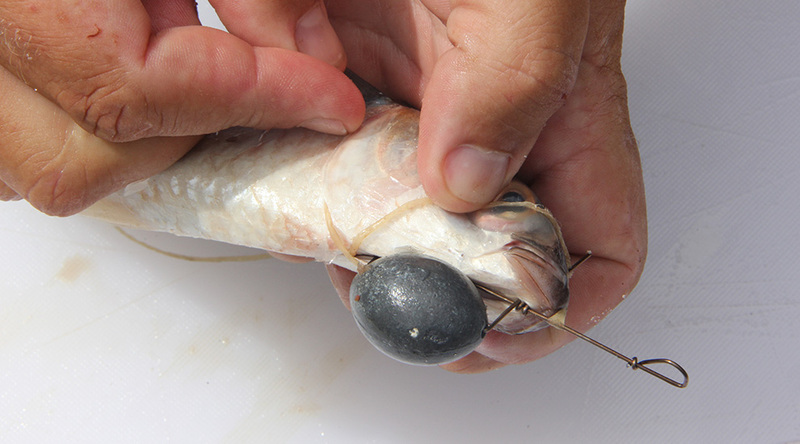 Removing the spine will give the bait more mobility so the bait's tail will flap irresistibly as pull the dredge. 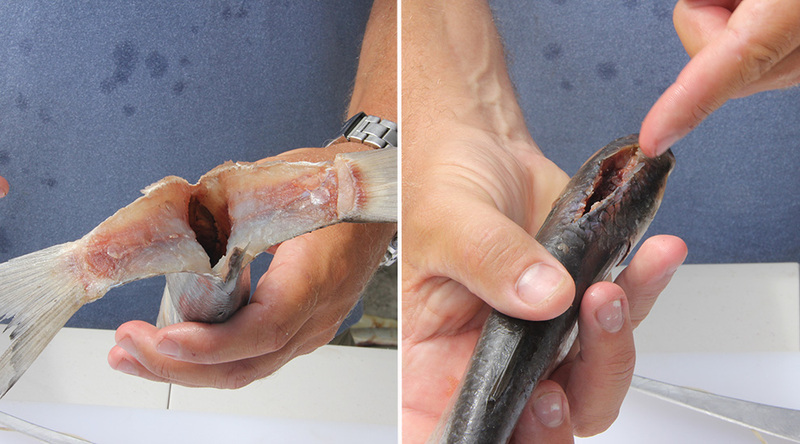 This video shows you how to wedge and split tail a mullet. 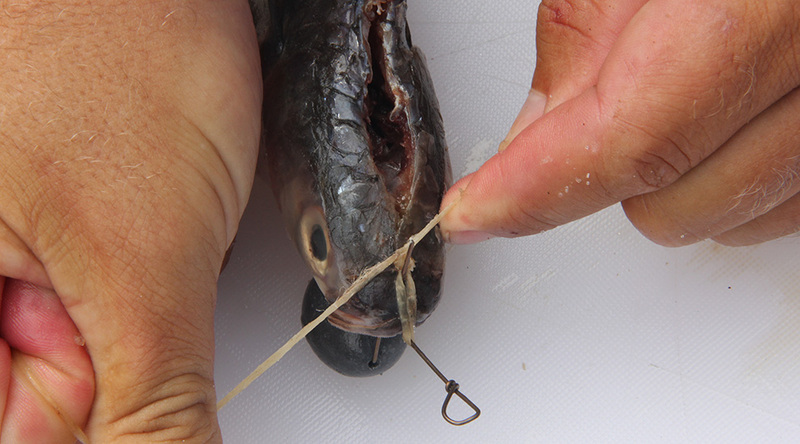 Start by inserting the pin rig into the gill on the underside of the mullet's head. 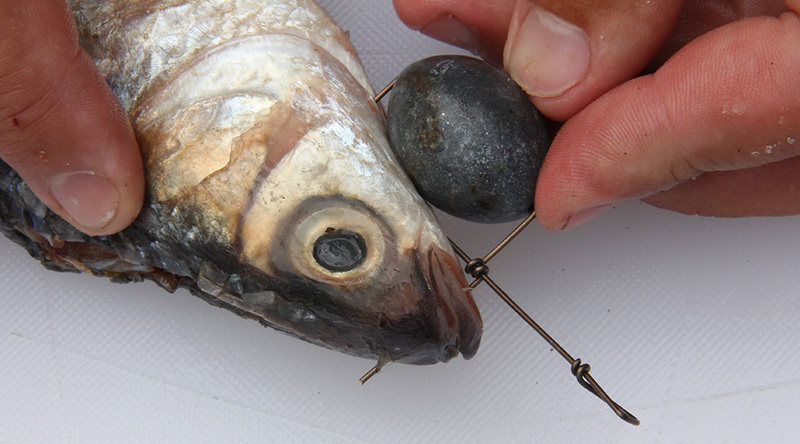 Push the pin up through the bait's nose, making sure that the exit point of the pin rig is perfectly centered in the top of the bait's head. 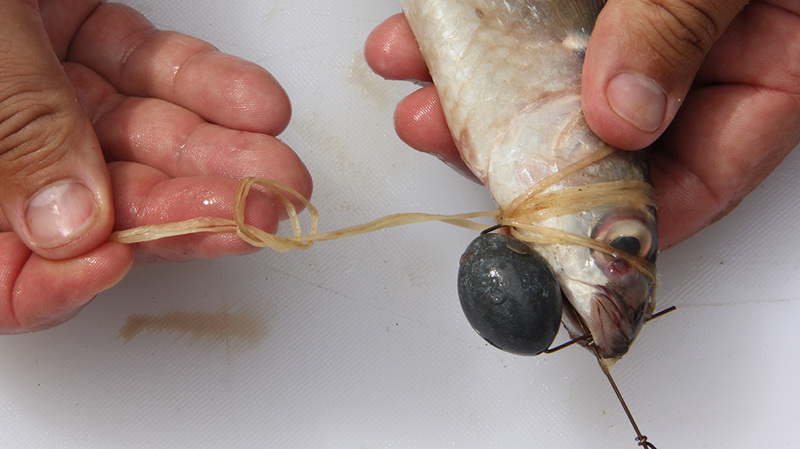 Tie an overhand knot in your thread, leaving plenty of tag end to work with. 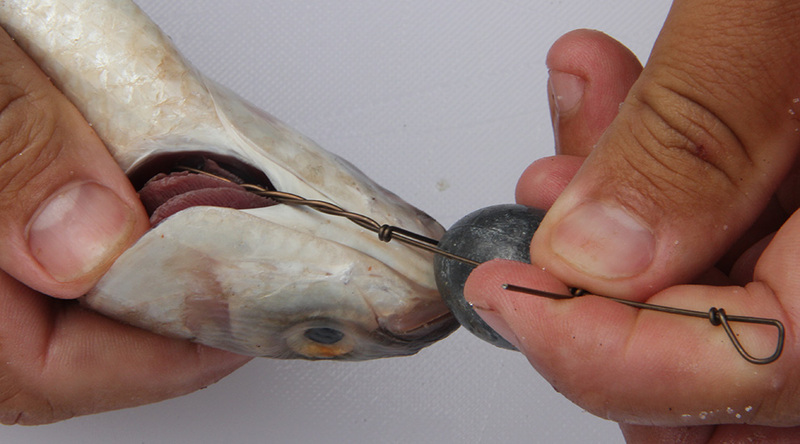 Loop the thread over the pin rig and tighten up the knot on top of the bait's head behind the pin. 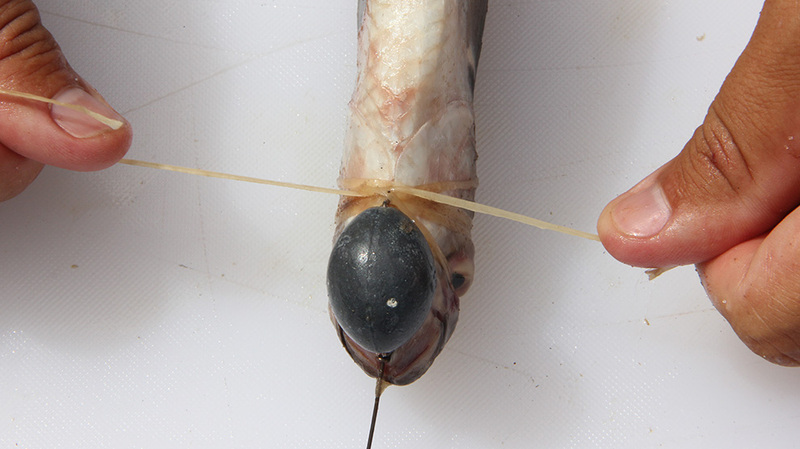 Cross the two thread ends under the head and behind the gills. Tie the thread above the head with a half-hitch. 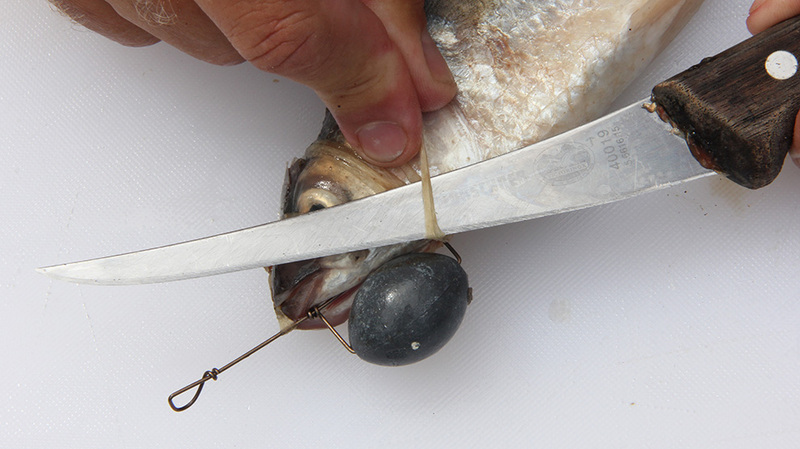 To help further reduce the profile of the mullet's head in the water, cut a second piece of thread and use it to cinch down the top of the bait around the cut made by wedging the top of the mullet. Tie the thread tightly and trim the tag ends. Continue to wrap your original thread ends around the head. Wrap each thread end three times around the head, making sure that your wraps are tight and even. Cinch down the thread under the chin right behind the pin rig. 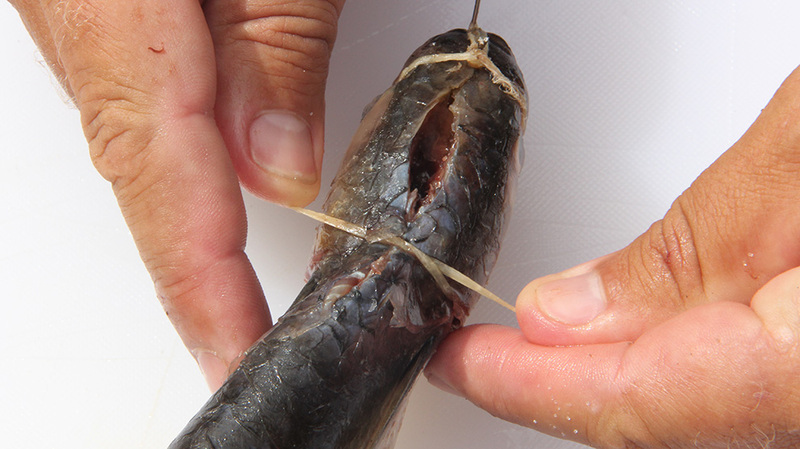 Finish by tying an overhand knot with the two thread ends. Cinch the second overhand knot down by pulling on the two threads and trim off the tag ends to finish the rig. The completed rig is ready to for your offshore dredge. 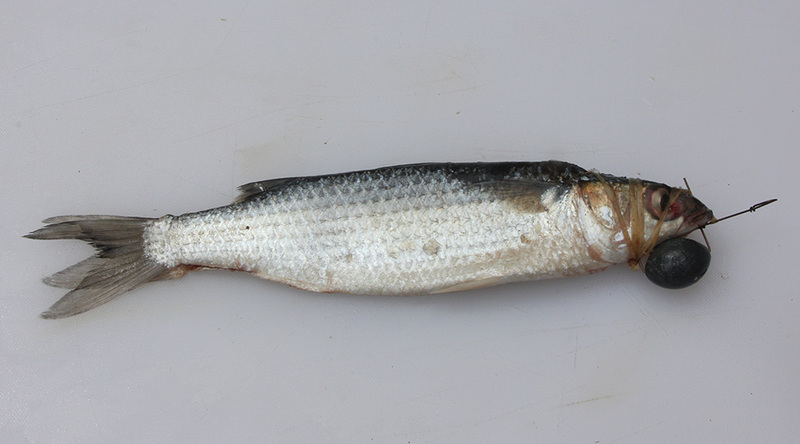 Running two or three arms of swimming mullet on your dredge will look like a ball of bait following the boat around all day. 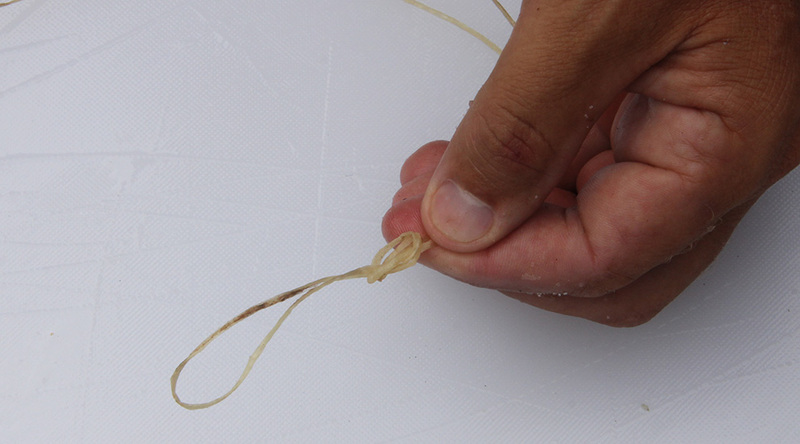 It's a deadly teaser, especially for white marlin and sailfish. 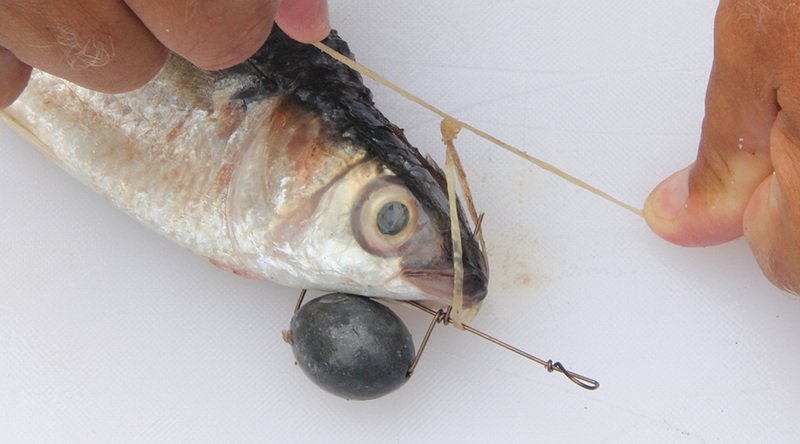 When your bait wears out or gets tagged by a fish, you can easily replace the mullet by cutting the threads away from the pin rig and starting over with a fresh bait.